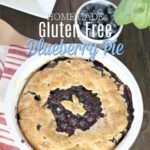 This homemade, gluten free, blueberry pie has a tart and sweet blueberry filling, sweetened with maple syrup and wrapped in a flaky, buttery gluten free crust. Now that we have moved to the pacific northwest, it feels somewhat awkward to use the word y’all, but hey I’m rolling with it. The amount of locally and sustainably produced fruits and vegetables are abundant here, and we are reaping all the benefits. The other night, my friend and I got in the car and drove to her friend’s beautiful farm on the edge of the mountains to pick blueberries and explore my future farming dream. I tried to move in, but my husband wouldn’t approve. Then the next day my other friend invited me to go blueberry picking again. 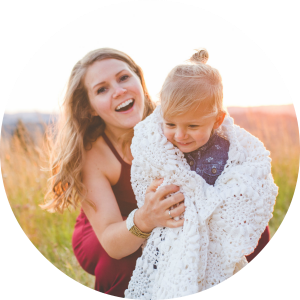 I picked about 17 or more lbs between the two pickings, and I want to go pick again (and by I, I mean my husband, because I’m supposed to be on rest… pregnancy problems). It was worth it. 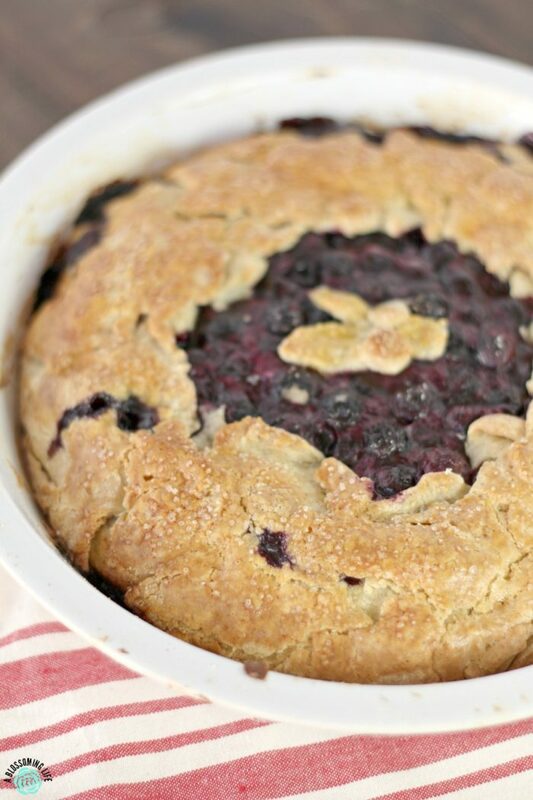 I’ve made this blueberry pie multiple times now, and we’ve been eating handfuls and handfuls of delectable and sweet, fresh blueberries, plus there are gallons of blueberries in the freezer. Honestly, we really need to invest in a deep freezer just to store all that amazing produce we are picking and producing ourselves. 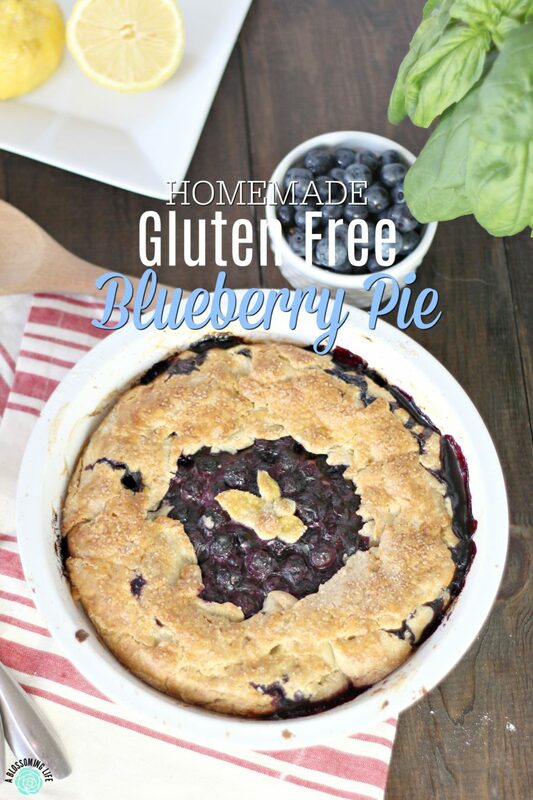 This homemade, gluten free, blueberry pie has a tart and sweet blueberry filling, sweetened with maple syrup and wrapped in a flaky, buttery crust. It is really hard to just enjoy one slice. It’s healthy, right? Blueberries, butter, egg. Heck, you could eat it for breakfast. The first time I made it, I made it without refined sugar, and it was still delicious. For the finished product I’m sharing with you today, I added a little bit of cane sugar to the crust and the top. The extra bit of sweetness really added the extra oomph it needed. But you really can omit it if you want to completely avoid sugar. I served this to our small group and got so many compliments including “this is really gluten free? I can’t even tell!” That is one of the best compliments one can get with gluten free baked goods. I hope you enjoy this delicious pie as much as our family has. It will definitely be a new family tradition. Pick delicious blueberries and make lots of pies. Cut up cold butter into small pieces and place in freezer for 5-10 minutes. In a food processor, pulse flour, sugar, and salt until combined. Add butter and pulse until mixture has no large pieces of butter remaining. Add egg and 1 tablespoons ice water, then pulse until well combined and dough holds together when squeezed, 1 minute. Add water one table spoon at a time if needed. Roll into a ball and place in the fridge or freezer for 5-10 minutes. Preheat oven to 375F. 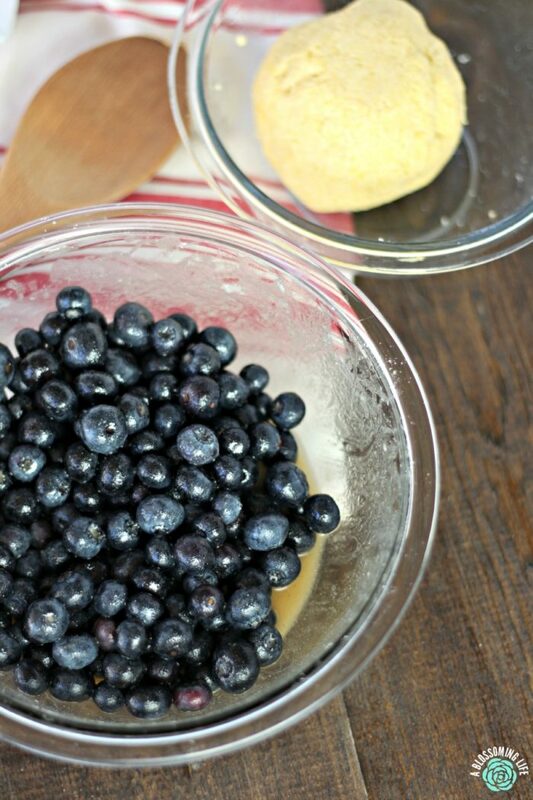 In a large bowl, add washed and dried fresh blueberries, GF flour, and cornstarch and mix. Add maple syrup and lemon juice and mix well. On a very well floured counter, roll out dough until about 1-8-1/4 inch thick. Place in pie dish. Add pie filling to the center and fold over extra pie crust. In a small bowl, make an egg wash by scrambling one egg and brush over pie crust. Sprinkle with sugar. Bake for 50-60 minutes, until crust is golden brown. Cook and enjoy. 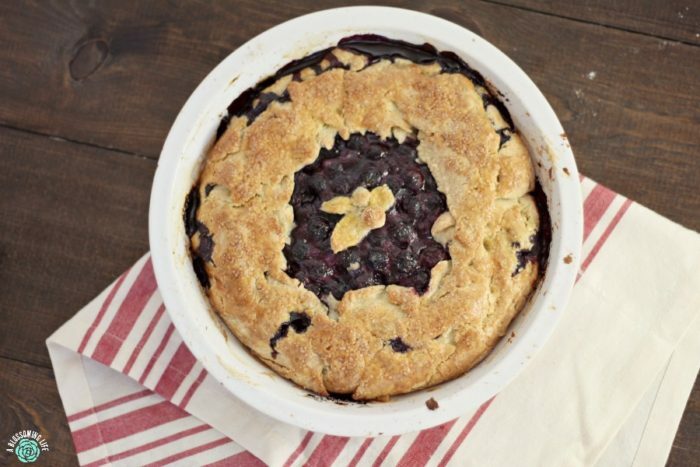 How much do you love blueberry pie?